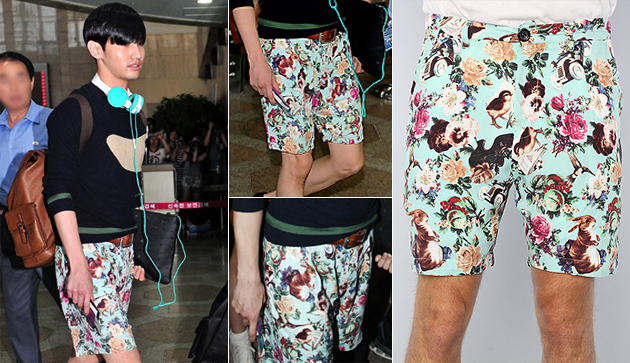 On August 3rd, 2012, TVXQ’s member, Changmin, was seen wearing the Elegant Affair Shorts in Mint Green from the latest Joyrich collection. Luckily for fans, the shorts are currently available at Karmaloop for $100.00, as always for up to 20% off, use repcode Kstyle. Last night, I was one of the 15,000 lucky fans that attended the October 23rd, 2011 SMTown Live NYC Concert at Madison Square Garden. As you may have heard, getting tickets for the event was difficult since they went on sale during school hours on a Friday. I had to spend over two hours on the phone during two classes before I finally got section 108 tickets. (The section I wanted) I went by myself because my friend could only find tickets for section 300. It wasn’t too bad. Anywho! In the morning, I had read the Daily News and saw that SMtown artists as well as other Kpop Stars were featured in the paper, pretty cool! I had been anticipating the concert for the longest time and so I’m glad it has received so much attention. I attend college right by Madison Square Garden and go to Timesquare almost everyday, so all the ads and videos were such a tease. f(x) was the first to perform with their song, La Cha Ta. This is one of my favorite songs of theirs, but to be it wasn’t exciting. Though I have to say the girls are absolutely GORGEOUS in person. Seriously. Afterwards, f(x) introduced themselves in english-very cute. Krytal then covered Ke$ha‘s Tic Toc with her sister Jessica from SNSD, another okay performance. After, Amber had the crowd going crazy and lead into Chuu. It was very fun to watch especially Victoria’s signature cart-wheel. SHINee’s Onew made a quick appearance as a Pizza boy delivering Sulli’s mic, where he “fell” in the middle of the stage. The stadium was filled with laughter. Up next was SHINee! They performed Replay, Get Down and Juliette. I have to applaud them because they were one fo the few artists that actually sang live. Not to mention their stage presence was very strong. Jonghyn did get strapped up and fly around the stage, I found it kind of unnecessary. Then to my surprise, Super Junior‘s K.R.Y performed Sorry Sorry Answer. 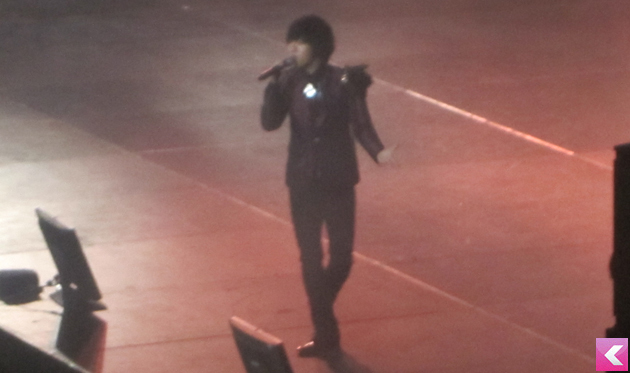 One of the main reasons I purchased a ticket for SMTown was to see Super Junior live…particulary Yesung. So this performance was a win for me. Although the guys looked tired, they looked handsome and their performance was amazing! I loved their suits too,very fitting. After Krystal and Key performed My First Kiss by 3OH!3 and Kesha, Super Junior’s Kyuhyun and SNSD‘s Seohyun performed Way back into love. This had to be one of my favorite performances of the night. Their voices were amazing and Seohyun looked absolutely gorgeous. As if the smile on my face couldn’t get any bigger, Key, Minho, Shindong and Eunhyuk were in the crowd making their way to the stage while performing AYO. 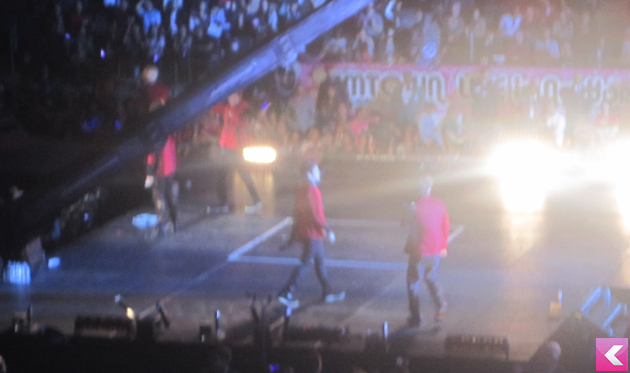 Then, the moment I had been waiting for-Super Junior came on stage. The whole time I had been conscious and made sure not to block the view of the people behind me, but once they came out…I shot up out of my seat at the sound of BONAMANA. After the intense performance, Super Junior plus Henry and Zhou Mi introduced themselves in English. It was too cute. Everyone tried their best, but I couldn’t help laugh. The guys then performed two of my favorite ‘old school’ Suju songs Miracle and a remix Dancing Out . BoA made her way on the stage and performed Look Who’s Talking and I Did It For Love alongside Key. Her stage presence was so fierce, not to mention she was witty, sweet and so pretty. I never realized how similar Luna and her look. Up next was SNSD with a special remix of Genie (Tell Me Your Wish) it was kind of awkward, but the girls looked gorgeous. 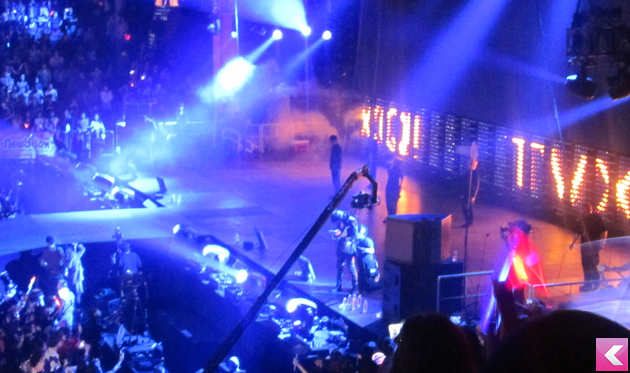 Right after there were performances of Super Junior’s Sorry, Sorry, SHINee’s Ring Ding Dong and f(x)’s Nu ABO. 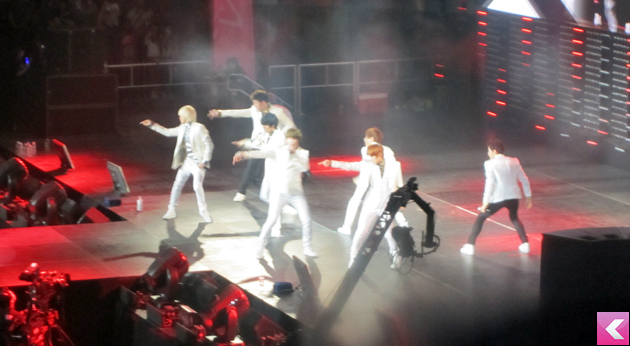 Super Junior then made their way back on stage and performed Mr. Simple. The crowd went crazy! After a brief moment the guys began to perform Don’t Don with a special performance from Henry and Zhou mi. Now, Don’t Don is not only my favorite Super Junior but song album. So you guys know I was all over that. Haha! Afterwards Kangta performed Breaka Shaka. I honestly don’t even remember that , maybe because I was still hyped from the guys. Then there were performances of f(x)’s Hot Summer, Girls’ Generation’s Hoot, SHINee’s Ready or Not and A.Mi.Go. After a costume change, SNSD debuted with their first US performances of The Boys. The girls were fierce and this was my favorite SNSD performance of the night. Love, loved, loved Tiffany’s dress. Oddly, Onew was next with a performance of The Name I Loved, it was definitely a weird transition. At least he wasn’t air lifted. Anywho, Taemin, Eunhyuk, Hyoyeon, Luna Yuri, Yoona, Sooyoung, Shindong, Minho, Donghae and Victoria performed their special dance routine. It was definitely hot and fun to watch! BoA followed that with performed Eat You Up, Copy & Paste and Energetic. TVXQ finally came out and everyone in the audience jumped out of their seats all at the same time. They performed Medley (The Way U Are/Mirotic), Maximum, Before U Go, Why? (Keep Your Head Down). They too were airlifted a few times. After there were performances of f(x)’s Pinocchio (Danger), SHINee’s Lucifer and SNSD’s Gee. For a majority of SHINee’s performances they used the air lift and had the guys fly over the crowd. At first I was like “Alright, okay.” but it got weird after a while. They would sing a high notes, fly, get down, dance, fly and sing high notes, get down and finish dancing. Though for Lucifer it got weirder, they wore glove claw things that were similar to Wolverines from XMen while they were flying. Turns out they are laser lights. You’ll have to see a fancam of this. After that craziness, Super Junior performed U and I couldn’t help but feel nostalgic. Sine it was the first Super Junior song I ever heard and I’ve always wanted to see them perform it live I had this giant grin on my face. It was a shame that a majority of the members weren’t there, but it was still my favorite performance of the night. As the guys prepared to throw their American flag printed scarves into the audience, I crossed my fingers hoping Yesung or any of the members would magically be able to through it my way, but of course that didn’t happen. Oh well. After TVXQ performed Rising Sun and BoA performed Hurricane Venus. I don’t remember those performances either. Haha. At the end, SM Town came out in their pink T-shirts and performed H.O.T’s Hope. It was really nice, confetti fell onto the crowd, I collected some in my pocket, waited a bit and made a quick exit to avoid the chaos and rush. Overall, I was glad I attended. It was a shame that a majority of the artist lip synced and I wish I was closer. Which reminds me, I had the chance to move to the first row of my section , but I wimped out. First row! Aigooo. Anyone who attended the event don’t be shy to leave a recap about your experience!